What can you save? Appliances? Cabinets? Countertops? Hardware? Sink? Faucet? especially if something is cooking on the stove. Garburators are out of favour again; don't spend the money. Backsplashes: If you have an existing one, think twice before removing the countertop - you'll need to remove the backsplash too and you'll be looking at drywall repair. For an economical backsplash look, install textured wallpaper before you paint; it adds interest without a lot of cost and is quite durable as it would be painted with kitchen finish paint. If you do tile, a simple pattern and neutral colour is important. Don't give people a reason to dislike it. thing to do is replace. I like to use IKEA cabinets; they are cost-effective and utilize a number of clever European features. The downside is that you have to assemble them yourself. But there are now two companies that will assemble and install. It also involves a trip to Vancouver, or shipping to the island. Cost effective cabinet lines mean less choice. However, it's possible to utilize even limited range cabinets in effective ways. Countertops: Almost always replace them. They are usually quite outdated and new countertops can transform a kitchen. that it must be ordered once the kitchen cabinets are in so they can be measured properly. It can take weeks to turn around so plan accordingly. Undermount sinks complicate the installation. white melamine and oak pull doors. I sprayed the handles with an espresso flat paint, and then added darker countertops. It looked much better. Sink / Faucet: I've been moving towards using large single sinks, or sinks with an extra-large basin on one side and a small one on the other. The equally sized sinks are dated; very few people use them to wash dishes anymore. Lighting: Good lighting is important. Always update the lighting fixtures. You can use the builder special types in hallways and bedrooms. Save the wow factor for the dining room light (which should not be bizarre, but should be unique) and the kitchen ceiling fixture or pendant lights. Pot lights can add up; I prefer great track lighting and interesting pendants. Make sure the fridge opens the correct way and have a landing space on that side of the fridge. Fridge doors can be switched to open either way. Bottom mount freezers are more desirable. I usually try to put the dishwasher next to the fridge, then the sink. Ensure you have 36" of space to work in between the sink and the cooktop. Often people have lots of countertop in areas that people don't want to work in. 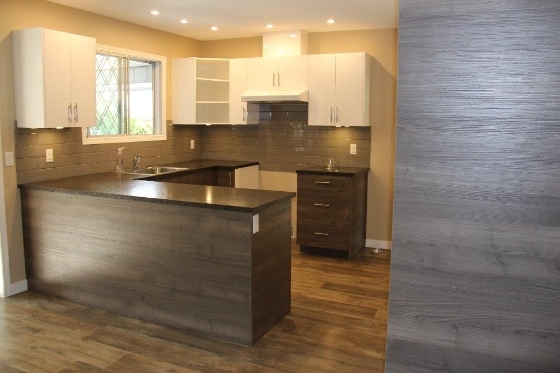 Add a small cabinet beside the stove; it shouldn't be beside a return wall or out in the open. It's dangerous for children to be able to knock handles and therefore pots off the stove. Recess a deep fridge if you can. 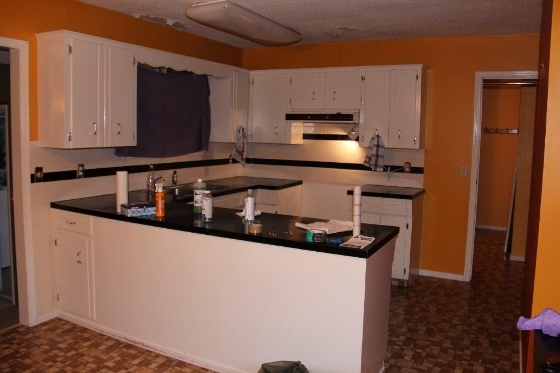 Nothing looks worse than a fridge that sticks out from the cabinets. Sometimes you'll have a closet behind you can frame the depth into. Use a deep cabinet over the fridge. If you take cabinets to the ceiling, put filler above to allow the upper cabinet doors to open without hitting the ceiling or light trims. Add under-cabinet lighting if possible. This adds wow factor, even during the day and it only takes one circuit. C-Add an eating bar. People love the idea of visiting with friends during meal prep. Distance from Island to other counter S/B minimum 36”. We had the room so went 44” That extra 6” really added to the feel of the kitchen flow. Open floor plans are popular, but Consider the style of house before you open up the kitchen to the dining room. Period homes demand a more formal approach, with a separate dining room. What can you save? Tub? Shower? Cabinets? Sink? Faucets? Hardware? 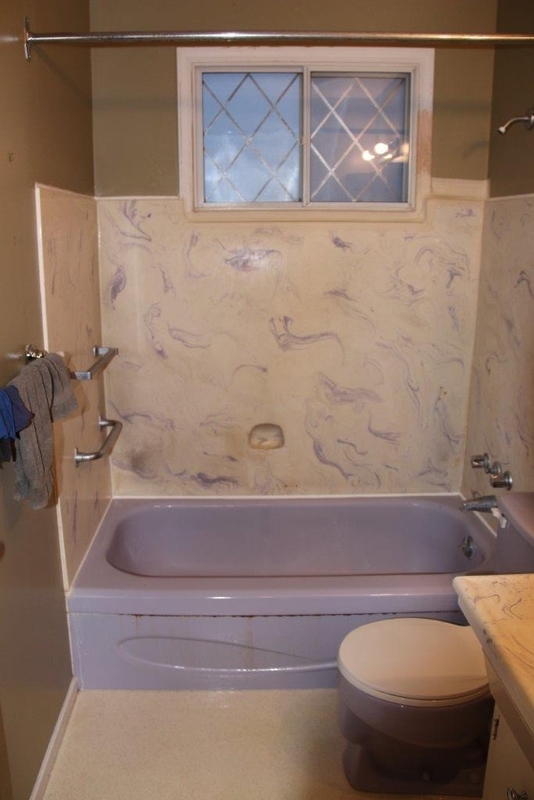 Often the tub or shower is salvageable with a good cleaning. Taking out a tub and replacing it is quite expensive. Protecting the tub and replacing the tile surround is much less expensive. Tubs can also be re-glazed. If the toilet is salvageable, clean it and keep it. Always replace the toilet seat with a brand new one. Existing cabinets/vanities: Can they be painted? I have spray painted older cabinets with an espresso finish. It hides the flaws. C-If you replace vanity, will the sink trap down pipe meet up with the wall exit pipe properly? On one project, I ordered a vanity through Costco that had plumbing hook-up behind the center hallowed drawers. Walls were in and painted. I had to rip out finished wall, to re-position the exit pipe to fit. Vessel bowls look cool but are extremely impractical. Don't use them except in a powder room. Jacuzzi tubs are not worth adding ... more people dislike than like them. Add a wood or painted frame around wall mounted mirrors to give them a custom look. It can be added over an existing mirror by routing out the back of the mirror. 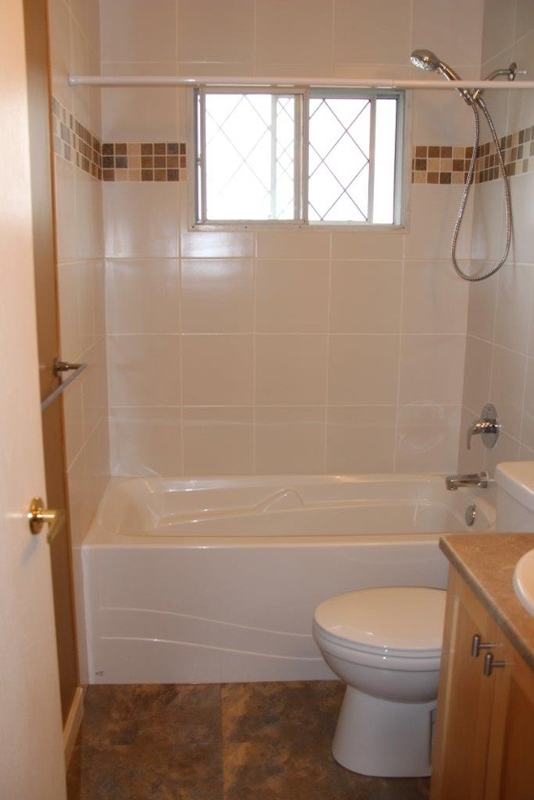 Consider switching a tub combo to a large shower in the ensuite. Original concept by Denise Andison C.K.D./C.B.D. Co-founder Victoria Real Estate Investment Club. Started flipping homes in 2004 and has remodeled multiple properties for flipping or holding since then. CliffNotes by Cliff…Victoria Realtor and passionate Renovator. Thank you for sharing Denise!